When I was young, being a baseball fan meant playing the game, collecting cards, and checking the sports section of the newspaper my dad brought home at the end of every workday. Each year I went to a couple games at Wrigley and a couple games at Comiskey, but otherwise, watching baseball was pretty infrequent. We didn't have cable, I was in school or playing somewhere when the Cubs were on WGN, and while the All-Star Game and postseason were already a big deal to me, they were rarities. I'd become an Indians fan at the age of six, but I bet I could count on my fingers the number of Tribe games I actually watched before reaching junior high. Julio Franco was my first favorite Indian, but he and the others I liked in those early years, I liked for what I could see on the front and back of their baseball cards. It was an appreciation for static things. 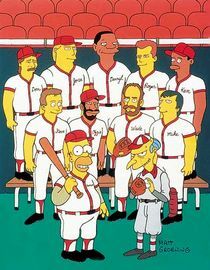 In the mid 90s we got cable, the Indians got good, and I could suddenly enjoy my favorite team far more dynamically. 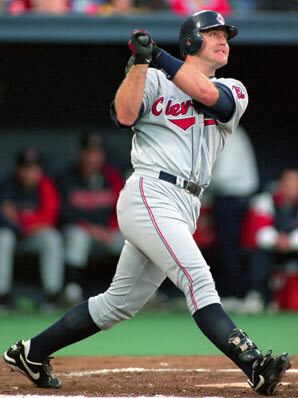 Thome was a 13th-round pick in 1989, began 1990 in rookie ball and made his MLB debut in 1991. It took him a little while to stick there, but strong hitting at the end of 1993 put him the Majors to stay. He was initially somewhat overshadowed by Albert Belle and Kenny Lofton, and later by Manny Ramirez and Roberto Alomar, but over the full course of the Tribe's great run from the mid 90s through the early 2000s, no one did more to help the team win ballgames than Thome did, and it's Thome who now holds the franchise record with 337 career home runs in an Indians uniform, including 52 of them in 2002, when he set the team's single-season record. I wasn't there for that one, because I never saw the Indians play in Cleveland until after I'd graduated from college, but I saw him hit a number of them at Comiskey, which during the Indians' stretch of dominance in the division often had as many Tribe fans as there were Sox fans. I remember a Friday night from my senior year of high school, when Thome, Matt Williams, and Manny Ramirez each homered, and then Sunday afternoon Thome homered again. I remember one summer during college, seeing Thome hit two home runs, and another game where he hit one that came to rest in the moat that used to exist between the field and the bleachers at Comiskey. I could easily have climbed over, dropped down, and grabbed the ball, and considered doing just that, but was too scared of getting kicked out to do it. To this day I still wonder if they would have let me keep the ball. I should have done it. I was also there the night in 1995 when Thome did something more remarkable than hitting a long home run: he tripled... twice! Thome hit only 26 triples in his entire career, and that night was the only time he ever did it twice in one game. Albert Belle also hit his 40th and 41st home runs of the season, and odds are that game will always be the most enjoyable time I ever have at a ballgame, as my favorite team continued to steamroll towards its first AL pennant in 41 years. Thome spent a bit more than half his career with the Indians, including a brief stint in 2011, when he was approaching retirement. He also had some big years for the Phillies and White Sox. He and Alex Rodriguez are the only players to hit 40+ home runs in a season with three different teams; he and Mark McGwire are the only players to hit 40+ home runs multiple times in both the American and National Leagues. Late in 2009 Thome was traded to the Dodgers, who were in postseason contention. Thus began the "have bat, will travel" portion of Thome's career. During his final three and a half seasons, Thome played for the Dodgers, Twins, Indians, Phillies, and Orioles. In 2010, at the age of 39, he hit 25 home runs for Minnesota, becoming one of only 20 players in MLB history to hit that many at such an advanced age. His OPS that season was 1.039. The only other players to post that high a figure in 300+ plate appearances at the age of 39 were Barry Bonds, Ted Williams, and Hank Aaron. Thome retired with 612 home runs, 451 doubles, 1699 RBI, 1583 runs scored. He wasn't just about power; Thome also had an elite batting eye, and drew 1747 career walks, seventh-most in MLB history. His career batting line was .276/.402/.554. His .956 career OPS ranks 19th all-time. Thome was tremendous at not making outs. When he did make an out, it was very often of the three strikes variety, as he totaled 2,538 strikeouts, second in MLB history. Home runs, walks, and strikeouts are known as the "three true outcomes," because there the possible results of a plate appearance that don't involve the defense making or not making a play. Given that Thome excelled in each of those area, it should come as no surprise that shortly before he retired, Thome became the three true outcomes king, taking over a crown that had previously belonged to Barry Bonds, Reggie Jackson, and Babe Ruth. For all his baseball accomplishments, and all the joy many of those accomplishments brought me, perhaps my favorite Thome memory didn't involve baseball. In 2013 Thome's wife and my mother-in-law were both prominently involved with the same charity, and my wife and I attended a dinner event which Thome and his wife were also at. Thome had established a strong reputation for being a good guy, well-liked by teammates, clubhouse attendants, and media members, but our own experiences always mean more to us than what we might read or hear about from someone else. Towards the end of the night I mustered up the courage to talk to Jim, who was standing alone. I mentioned being an Indians fan, but before I knew it, Thome had turned the conversation around, and instead of me asking him about his career, he was asking me about mine as a teacher. The ten or fifteen minutes he spent asking me questions and really listening to my answers about the joys and frustrations of trying to help a couple dozen ten-year-olds made just as big an impression on me as the 511-foot home runs.